Check-in time for both cabins and camping is from 3 pm. When checking in, you will receive a vingcard which you will use to enter/exit the gates, as well as get access to the South service building. These cards are personal and may not be lent out to anyone else. They must be returned to the reception before your departure. If you forgot to bring bed linen and towels, you can rent this from the reception. You can also rent crib and highchair if you are travelling with a baby. If there should be anything wrong or missing, please notify the reception immediately after arrival. Do not try and fix the problem by yourself. For everyone’s comfort it is important that all our guests follow our regulations. These can be found in the reception, and here on our website. Enjoy your stay! 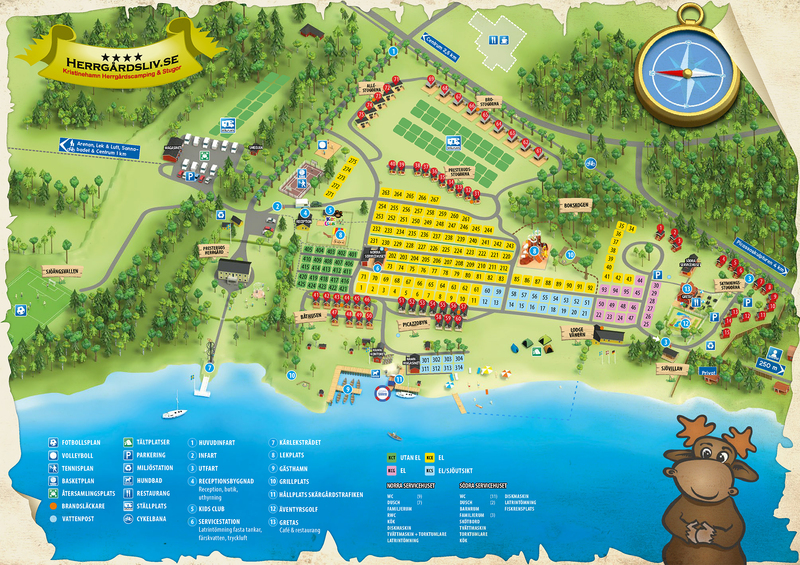 Check-out time for cabins is 11 am, for camping pitches 12 am. Contact the reception if you want to stay a little longer. For this there will be a fee per extra hour. Note! This is only possible if the cabin/camping pitch is available. If you have stayed in a cabin, this must be cleaned thoroughly before departure. It is possible to buy this service from us. Notify the reception in advance. If you buy this service from us, you must still do the dishes and take out the trash. If there is any broken china or damage to the furnishings, this should be paid for in the reception at check-out. Trash must be sorted and recycled at the recycle station. We will check your cabin after check-out. If the cabin is not cleaned according to the instructions, we will send you a bill for this. Keys and vingcards must be returned to the reception. If the reception is closed you can leave them in the postbox outside of the reception. We hope you had a great stay! Welcome back!